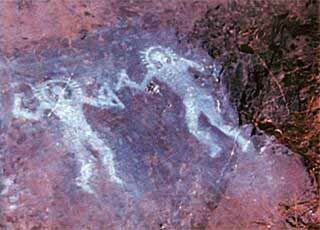 Paintings from Val Camonica, Italy, c.10,000 BC, have been claimed to depict extraterrestrial visitors. It has also been posited that they show gods or other mythological persons from religions of that time. 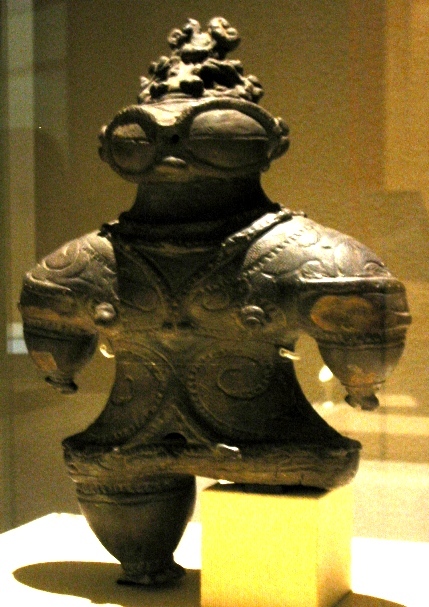 The Dogū (土偶) has been speculated to be an Ancient Astronaut that visited earth during the Jōmon period of Ancient Japan, it shows features claimed to resemble a space suit, goggles and a space helmet. Ancient astronaut theories are various proposals that the Earth had, before first human record, been visited by intelligent extraterrestrial beings, and that such contact is linked to either the origins or development of human cultures, technologies and/or religions. Indeed, some of these theories suggests that gods from most -- if not all -- religions are actually extraterrestrial beings, and their technologies were mistaken for divine entities by primitive man. While no peer-reviewed scientific journal validates such claims, these theories have been popularized, particularly in the latter half of the 20th century, by writers Erich von Däniken, Zecharia Sitchin and others. Ancient astronaut theories also may include the idea that civilization may have evolved on earth twice, and that the visitation of ancient astronauts may reflect the return of descendants of ancient humans whose population was separated from earthbound humans. Proponents of ancient astronaut theories point to what they perceive as gaps in historical and archaeological records and also what they see as an absence of definitive explanations in certain contexts from the archaeological sciences. Advocates of these theories put forward as evidence their interpretations of various archaeological artifacts, which they deem to have been anachronistic or beyond the presumed technical capabilities of the historical cultures they are associated with. Another common theme relies upon the interpretation of depictions in certain ancient artworks as being representations of actual extraterrestrial visitors as realized by the contacted cultures. Critics maintain, however, that any gaps in contemporary knowledge of the past do not demonstrate that such speculative ideas are a necessary, or even plausible, conclusion to draw from the available data. A number of ancient astronaut claims are made in direct opposition to the consensus scientific interpretation of evidence and to legitimate scientific explanations. The scientific community remains generally skeptical, and the dominant view is that there is no actual evidence to support ancient astronaut and paleocontact theories. Ancient astronaut theories may be considered a subset of paleocontact theory, a hypothesis that intelligent extraterrestrials have visited Earth. Carl Sagan, I.S. Shklovskii and Hermann Oberth are three notable scientists who have seriously considered this possibility. Ancient astronaut adherents often claim that humans are either descendants or creations of beings who landed on Earth millennia ago. An associated theory is that much of human knowledge, religion and culture came from extraterrestrial visitors in ancient times. Ancient astronauts acted as a “mother culture”. These ideas are generally discounted by the scientific community. Intelligent extraterrestrials visited the Earth in ancient times and profoundly affected the development of human civilization. Theosophical writings of the 19th and early 20th centuries contain many precursors to the ancient astronaut theories. Theosophy influenced authors such as H. P. Lovecraft, Charles Fort, and Erich von Däniken. Erich von Däniken was a leading proponent of this theory in the late 1960s and early 1970s, gaining a large audience through the 1968 publication of his best-selling book Chariots of the Gods and its sequels. Certain artifacts and monumental constructions are claimed by von Däniken to have required a more sophisticated technological ability in their construction than what was available to the ancient cultures who constructed them. Von Däniken maintains that these artifacts were constructed either directly by extraterrestrial visitors or by humans who learned the necessary knowledge from said visitors. These artifacts and monuments include Stonehenge, the Moai of Easter Island, the Antikythera mechanism and the Ancient Baghdad Electric Batteries. Von Däniken claims that ancient art and iconography throughout the world illustrates air and space vehicles, non-human but intelligent creatures, ancient astronauts and artifacts of an anachronistically advanced technology. Von Däniken also claims that geographically separated historical cultures share artistic themes, which he argues imply a common origin. For one such example, refer to von Däniken's interpretation of the sarcophagus lid recovered from the tomb of the Classic-era Maya ruler of Palenque, Pacal. Von Däniken claimed the design represented a seated astronaut, whereas the iconography and accompanying Maya text clearly identifies it as a portrait of the ruler himself with the World Tree of Maya mythology. The origins of many religions are interpreted by von Däniken as reactions to encounters with an alien race. According to his view, humans considered the technology of the aliens to be supernatural and the aliens themselves to be gods. Von Däniken claims that the oral and written traditions of most religions contain references to alien visitors by descriptions of stars and vehicular objects traveling through air and space. The author maintains that these should be seen as literal descriptions from eyewitnesses that have been interpreted by primitive peoples as supernatural events, or changed during the passage of time to become more obscure, rather than symbolic or mythical fiction. One such is Ezekiel's revelation in the Old Testament, which Däniken interprets as a detailed description of a landing spacecraft. Since the publication of von Däniken's books, no substantial evidence has been found to verify his claims, while much claimed evidence has been disproven. Zecharia Sitchin's series The Earth Chronicles, beginning with The 12th Planet, revolves around Sitchin's interpretation of ancient Sumerian and Middle Eastern texts, mysterious megalithic sites and anomalous artifacts from around the world. He theorizes the gods of old Mesopotamia were actually astronauts from the planet Nibiru, which the Sumerians believed to be a remote "12th planet" (counting the Sun, Moon, and Pluto as planets) associated with the god Marduk. According to Sitchin, Nibiru continues to orbit our sun on a 3,600-year elongated orbit. Though modern astronomy has yet to find any direct evidence of this hypothetical planet, a number of recent observations of anomalies in the Kuiper belt and cometary trajectories have led some mainstream astronomers to suggest the explanation lies in the existence of a large planetary or stellar body part of yet beyond our known solar system . Sitchin also suggests that the asteroid belt between Mars and Jupiter is the shattered remains of the ancient planet "Tiamat" which he claims was destroyed in one of Niburu's orbits through the solar system. According to Sitchin, the Sumerians relate how 50 Anunnaki or inhabitants of Nibiru came to Earth approximately 400,000 years ago with the intent of mining raw materials for transport back to Nibiru. With their small numbers they soon tired of the task and set out to genetically engineer laborers to work the mines. After much trial and error they eventually created homo sapiens sapiens: the "Adapa" (model man) or Adam of later mythology. Sitchin claims the Anunnaki were active in human affairs until their culture was destroyed by global catastrophes caused by the abrupt end of the last ice-age some 12,000 years ago. Seeing that humans survived and all they had built was destroyed, from that point he says, "kingship was lowered from heaven to Earth" and the Anunnaki left Earth after giving humans the opportunity and means to govern themselves. Robert K. G. Temple's 1976 book, The Sirius Mystery presents a case that the Dogon people of northwestern Mali preserved an ancient account of extraterrestrial visitation around 5,000 years ago. He quotes various lines of evidence, including advanced astronomical knowledge inherited by the tribe, descriptions, and comparative belief systems with ancient civilizations such as ancient Egypt and Sumer. His work draws heavily on the studies of cultural anthropologists, Marcel Griaule and Germaine Dieterlen. His conclusions however, have seen criticism by Carl Sagan and Ian Ridpath, who pointed out discrepancies within Temple's account, and suggested that the Dogon may have received some of their information recently and probably from European sources. In addition, noted anthropologist and ecologist, Walter E. A. van Beek criticizes Temple's sources, mainly Griaule, for misrepresenting Dogon ethnography, imposing his own ideas, and fabricating his account. In direct response to van Beek's rebuttal however, daughter and colleague of Marcel Griaule, Genevieve Calame-Griaule provided a detailed refutation of her own. She dismisses van Beek's charges as being marred by a confusion of esoteric traditions and based almost entirely on speculation. Temple responded to his critics by pointing out that certain information, like the density of Sirius B, had only been acquired by Westerners but a few years earlier. He also noted the possible detection of a third star in 1995 , of which had already been documented as being incorporated into Dogon mythology. Skeptic and space journalist, James Oberg was cautious in his approach to the information, stating that enthusiasts of Temple's claims have neither been proven or disproved in their assertions, and while Temple was not able to establish unquestionably the antiquity of most of the information in question, speculative notions of recent attainment from Europeans is "entirely circumstantial", and concludes that it is likely we will never know for sure and this case may in fact remain a mystery. Raëlism, or Raëlianism, is a religious movement created by Claude Vorilhon (or Raël). Raël claims to have encountered extraterrestrials on a number of occasions. On one such occasion, he claims that he was informed that humans were created by an advanced extraterrestrial humanoid race the Elohim, using their knowledge of DNA & Genetics. The Raëlian movement also argues against evolution and supports human cloning. Earlier sources — while generally not referencing ancient astronauts per se — suggest the creation of some monuments was beyond human means, such as Saxo Grammaticus' suggestion that giants had created Denmark's massive dolmens, or in tales that Merlin had assembled Stonehenge via magic. Another frequent theme that can be encountered in many mythologies is a person who comes from far away as a god, or as the archetype of a "civilizing hero" who brings knowledge to mankind. Prometheus is the best-known Western example. In Native American lore there are numerous examples, including Quetzalcoatl of the Aztecs and Viracocha of the Incas. The cross-cultural similarities of deities coming from the heavens and the manners in which they speak to humans are explained by some as evidence of visitations by extraterrestrial beings. The myths of Gods and Godesses are supposedly real accounts of these visitations. The extraterrestrials are seen as divine due to their technology, which is superior to the point it can only be explained as the “powers” or magic of the God or Goddess by the creators of the deity myths. Proponents cite ancient mythologies to support their viewpoints based on theories that hold that ancient creation myths of a god or gods who descend from the "heavens" to earth to create or instruct man are actually representations of alien visitors, whose superior technology accounts for their reception as gods. Such phenomenon is not unknown in modern times as is sometimes the case when primitive or isolated cultures are exposed to Western technology. In 1519, with his fair skin and "high technology", the Spanish conqueror Cortez was greeted by the unsuspecting Aztecs as the returning God Quetzalcoatl . In the early 20th century, "cargo cults" were discovered in South Pacific; cultures who believed various Western ships and their cargo to be sent from the Gods as fulfillment of prophecies concerning their return . In the Biblical Old Testament, the Book of Ezekiel tells of a flying object seen as a fiery whirlwind which when descended to the ground gave the appearance of being made of metal. It is described among other things as a wheel within a wheel containing four occupants, "living creatures", whose likeness was that of man. The passage goes on to say that wherever the wheels went the creatures went, and when the living creatures were lifted up the wheels were lifted up . The apocryphal Book of Enoch tells of similar flying objects and beings, but goes further in that Enoch is taken on journeys to various corners of the Earth in the object and at one point even travels to the heavens . In several chapters of the Old Testament, the Hebrew God Yaweh is depicted as traveling as a column of smoke and/or fire and making the sound of a trumpet. These descriptions also describe Yahweh as a physical presence, not an abstraction. Yahweh is described raining lightning and stones down upon the enemies of the Hebrews. However, descriptions of the Hebrew God have also featured protecting wings and outstretched arms in the Psalms, features which may be considered contrary to theories of mechanical manifestations of God, but tellingly refers to the different perceptions of their God given the different eras the stories were written . Additionally, the characteristics of the Ark of the Covenant and the Urim and Thummim are identified as suggesting high technology, perhaps from alien origins . Physical evidence includes the discovery of ancient "model airplanes" in Egypt and Peru, which are said to be similar to modern planes and gliders, although typically these are interpreted by archaeologists as stylized interpretations of birds. More support of this theory draws upon what they claim to be flying saucers in medieval and renaissance art. Objects in the paintings that cannot be explained with relevance to the art piece are often assumed to be flying saucers . This is used to support the ancient astronaut theory by attempting to show that the creators of humanity return to check up on their creation throughout time. Other artistic support for the ancient astronaut theory has been sought in Palaeolithic cave paintings. Vondijina in Australia and Val Camonica in Italy (seen above) are claimed to bear a resemblance to present day astronauts. Supporters of the ancient astronaut theory sometimes claim that similarities such as dome shaped heads, interpreted as beings wearing space helmets, prove that early man was visited by an extraterrestrial race. The famous Lid of Palenque, the ancient 5 ton sarcophagus lid found near modern day Palenque in Mexico, displays an intricate carving said to depict the Mayan king inside a rocket ship . In modern times, the idea of ancient astronauts seems to have been given serious consideration by the United States Air Force who devoted an entire chapter to UFO's as part of their Department of Physics textbook Introductory Space Science, Volume II which was included in the Colorado Air Force Academy curriculum until it was removed in the 1970's. "From available information, the UFO phenomenon appears to have been global in nature for almost 50,000 years." Many supporters of this theory cite the Nazca lines as evidence because the figures created by the lines are most clearly depicted or only able to be seen when viewed from the air. Writing professor Joe Nickell of the University of Kentucky, using only technology he believed to be available to people of the time, was able to recreate one of the larger figures with a reasonable degree of accuracy . Evidence for ancient astronauts is purported to include such ancient monuments and megalithic ruins as the Giza pyramids of Egypt, Machu Picchu in Peru, or Baalbek in Lebanon among others . Supporters contend these structures could not have been built with the limited technical abilities or tools of the people of the time and argue as well that many could not be duplicated even today. They suggest it is not only the unwieldy size of the stones, but also the precision they were laid and great distances many were transported which leaves the question open as to who could have possibly built them. While these contentions are categorically rejected by mainstream archeology, regardless of their origin, mysteries still remain as to how and why such structures were built. Such allegations are not unique in history, however, as similar reasoning lay behind the wonder of the Cyclopean masonry walling at Mycenaean cities in the eyes of Greeks of the following "Dark Age," who believed that the giant Cyclopes had built the walls. As well as aliens, other candidates for the lost civilizations that taught or provided these skills are the pseudo-historical lost continents of Atlantis, Lemuria and Mu. Challenging the idea that the transporting of huge megaliths by ancient man was beyond their capabilities, archaeologists at Easter Island have attempted to demonstrate how people with stone age technology could have moved small megaliths short distances like some of the Easter Island Moai. The poured concrete Moai used in the demonstration weighed approximately 6 tons and was lifted onto the sled by modern crane, but was able to be moved with rollers several meters and erected upright. Actual Moai, however, weigh on average 12.5 metric tons with the largest erected being 74.4 metric tons. The three largest megalithic stones at Baalbek which together are referred to as the "Trilithon", are the largest stones quarried by man and are estimated to weigh 1000 tons each with an even larger fourth stone still lying in the quarry over 1/2 of a mile away . The three stones sit on top of a wall nearly 26ft high comprised of similar stones weighing between 50-500 tons. The world's land record for greatest weight lifted by a mobile land crane is 1000 tons set by the Lampsons's Transilift Series II A. With a maximum un-modified lift capacity of 1100 tons, this crane requires 80 semi-trailer trucks to deliver the components and 3 weeks to assemble . Other than the proponents' own interpretations of ancient writings and artifacts, there has yet to be found any hard evidence to support the ancient astronaut hypothesis. Alan F. Alford, author of “Gods of the New Millennium”, (1996) is an adherent of the ancient astronaut theory. Much of his work draws on Sitchin’s theories. However, he does admit to some faults in Sitchin’s theory after deeper analysis. Lieb, Michael (1998). Children of Ezekiel: Aliens, Ufos, the Crisis of Race, and the Advent of End Time. Duke University Press, p.250. .
(1961) Cithara. St. Bonaventure University, p.12. Von Däniken, Erich (1984). Chariots of the Gods. Berkley Pub Group. Winners of the Ig® Nobel Prize. Retrieved on May 18, 2007. Temple, Robert K. G., The Sirius Mystery, 1976. Walter E. A. van Beek: "Dogon Restudied: A Field Evaluation of the Work of Marcel Griaule." Current Anthropology, 32 (1991): 139-167. Wikipedia Baghdad Battery article: "On Myth Busters episode 29 (which aired on March 23, 2005), the Baghdad battery "myth" was put to the test… For the religious experience aspect of the batteries, a replica of the fabled Ark of the Covenant was constructed, complete with two angels (resembling Adam and Jamie). Instead of linking the angels’ golden wings to the low power batteries, an electric fence generator was connected. When touched, the wings produced a strong feeling of tightness in the chest. Although the batteries themselves had not been used, it was surmised that, due to the apparent lack of knowledge of electricity of ancient people, any form of unusual sensation from them could equate to the “divine presence” in the eyes of ancient people. Wikipedia article on Urim and Thummim: "According to the teachings of Judaism, a small parchment with God's holy name, the Tetragrammaton, inscribed on it was slipped into an opening under the Urim and Thummim on the high priest's breast plate, which caused the breastplate to "glow" and thereby "transmit messages" from God to the Children of Israel."